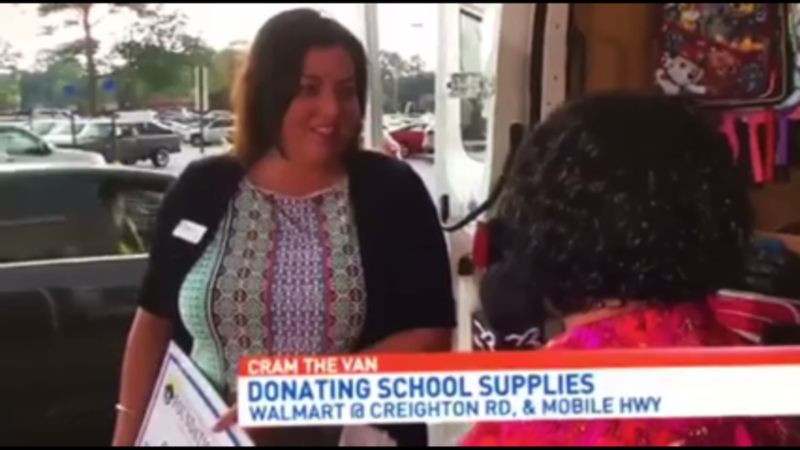 Escambia County Public Schools Foundation – Foundation donates $2000 to Cram the Van! Foundation donates $2000 to Cram the Van! A true sign that it is almost time to go back to school is the United Way's Cram the Van activities. Today, even in the rain and surrounded by thunder and lightning, Sue Straughn is gathering donations and spreading the word. Kristie Tittle Kelley was on hand to hand off a $2000 check from the Escambia County Public Schools Foundation to Sue so more supplies may be purchased! School representatives will pick up the donated items and get them into classrooms all over the county, so no child goes without the basic supplies they need in school. Thanks go to United Way, WEAR TV, Cat Country Radio and our amazing community and organizations like the ECPS Foundation!